From the very beginning, our mission at Riminder has always been preventing recruiting bias to reveal everyone’s full potential. To achieve that goal we believe that building inclusive machine learning is the key. As above, to get computers to do something new we used to program them. Programming required laying out detailing every single step and action in order to achieve our new goals. Now, even if you don’t know how to describe a certain problem, you can teach a computer how to solve it through Machine Learning. Machine learning algorithms provide a computer with the ability to automatically learn and improve itself from experience only by drawing examples from the data. The more data and computation power they can access, the better they get. Deep Learning is an area of Machine Learning based on networks of simulated neurons inspired by how the human brain works. As a result, Deep Learning algorithms have no theoretical limitations and allows computers to outperform traditional Machine Learning algorithms and even the human performance in specific tasks. Faster machines and multicore CPU/GPU (NVIDIA) allowed both the usage of DL algorithms in production but also the emergence of new models and ideas through iterations. Most importantly Deep Learning algorithms allow better leverage of unstructured data by engineering their features and representations to achieve a given goal without requiring any prerequisites about the data field from the Developers who are training them. An impressive example was Kaggle competition won by a team of Geoffrey Hinton about automatic drug discovery — beating all the international academic community with no background in chemistry, biology or life sciences, all in just two weeks! > A conscious one: Adversarial Examples. > An unconscious one: Bias. Adversarial examples are inputs to machine learning models intentionally designed by an attacker to cause an incorrect output prediction from the model. They are to machines what “optical illusions” are to human. For instance by adding a small and well-calculated noise/perturbation to any image you can completely change the original prediction of a model with a high confidence. Even worse a malicious hacker can leverage these weaknesses to fool a Learning Model and take control of your future self-driving car making it blind to pedestrians’ presence on roads. Recent research has shown adversarial examples can still fool a system even after they have been printed. A recent paper shows that humans are not different from computer systems and that real life adversarial examples can fool humans too. >20th century: Statistics, systematic difference between a sample and a population. Machine Learning systems are keeping on being integrated into the life of millions of people every day. Thus, the research on Machine Learning Bias is wholly justified. in contrast with “over-fitting”, a situation of “low bias & high variance”. Considering the Bias problem in Machine Learning as a purely technical problem leaves out a whole part of the picture. Training data is often biased by the world large history of human undue prejudices.As a consequence, this introduces a new intrinsic bias (legal) in the learning systems that cannot be solved even with model validation techniques. As consequence, Machine Learning models can still be biased from a legal perspective while being unbiased from a technical standpoint. Even with the best intentions, it’s impossible to separate humans from their own biases. keeping up with the rapidly changing job landscape ( +60% of the jobs that we need in the next 20 years do not exist yet, source: McKinsey). By eliminating bias, in recruitment we allow businesses to identify 3x times more relevant talent within their existing databases while cutting 1/2 the time to fill a position. By qualifying (parsing+enriching+scoring) every element of the career path of the candidate (namely the working experiences, projects, educations, hard skills, soft skills, transitions, etc.) we identify the overlooked connections between positions. At the opposite of a keyword system, for which a “sous-chef” and an “ event manager” are unrelated, our technology understands the hidden correlations between them — such as being highly organized and being able to perform well under pressure. 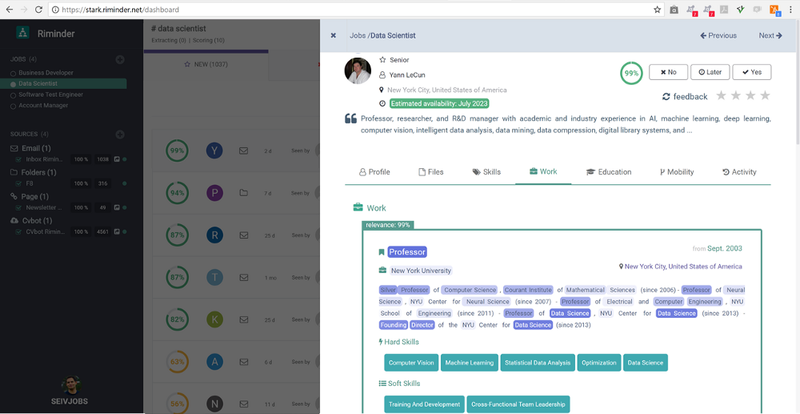 First Parsing: we use Deep Computer Vision and Natural Language Processing to parse each resume as a structured data profile. Third Custom Scoring: a custom layer based on the internal data of the company and feedbacks from the recruiters to fit its specific needs regarding culture and requirements. Fourth Revealing: explaining the evidence behind every recommendation taken by our algorithms. >Language bias: always send a resume in the most commonly used language in the company. People focus on the language that is the easiest for them. >Layout bias: always send a one-pager mono-column double-color resume. People focus on the layouts that is the easiest to read. →Interview likelihood: +N columns= -3.2% x N and +N pages = -3.8% x N.
Statistical Parity: belonging to a subgroup of a large community should not change the outcome of a classifier. Individual Fairness: Ensures that if two individuals are similar according to metric the outcome of the prediction should follow that metric. Equality of Opportunity: Persons that are fully qualified for an outcome shouldn’t see their outcome changing based on their belonging to a subgroup. Predictive Parity: If a classifier had favored an outcome for a subgroup, the hypothesis should be true in the real life. Statistical parity, but focused on qualified individuals only. Those definitions of fairness and parity are not exhaustive. A recent research paper shows that they are fundamentally in conflict and cannot be satisfied simultaneously. Inherent Trade-off in the Fair Determination of Risk Scores. Word embeddings are widely used in Natural Language Processing to represent word syntactically and semantically . → vector(man) — vector(woman) = vector(king) — vector(queen) . → vector(man) — vector(woman) = vector(men) — vector(women) . → vector(man) — vector(woman) = vector(developer) — vector(designer) . A recent paper, available, introduced a novel approach to de-bias Word Embeddings using Crowdsourcing. >Second: Build a matrix W of the (X-Y) pairs. >Third: Take the singular value decomposition of W to find the subspace corresponding to gender stereotyping. Most of the time, these singular values are very skewed, and it is easy to select the top one or the top two singular vectors to represent this bias subspace. Man Is To Computer Programmer as Woman is to Homemaker? Debiasing Word Embeddings. — Retrain the classifier to satisfy fairness constraints. — Ensure features learned are not propagating training data biases. — Exercise demonstrating Pinned AUC metric. — Exercise demonstrating Mitigating Unwanted Biases with Adversarial Learning. >Data Decisions and Theoretical Implications when Adversarially Learning Fair Representations (Beutel et al., FAT/ML 2017). — Fair Resource Allocation in a Volatile Marketplace (Bateni et al. EC 2016). — Reservation Exchange Markets for Internet Advertising (Goel et al., LIPics 2016). You can start now using our self-service API without any painful setups. HR software companies? Why structuring your data is crucialfor your business?